The samples of snoek examined and cooked in the Experimental Kitchens on February 18th were all of a salt variety. The fish was tested as it came from the tin, also in made up dishes. 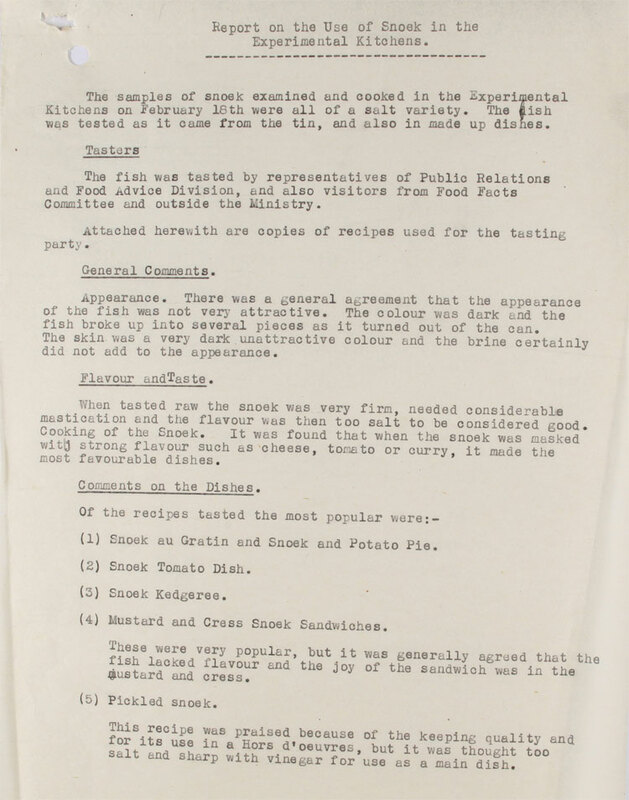 The fish was tested by representatives of Public relations and Food Advice Divisions, and also visitors from Food Facts Committee outside the Ministry. Attached herewith are copies of recipes used for the testing party. Appearance. There was general agreement that the appearance of the fish was not very attractive. The colour was dark and the fish broke up into several pieces as it turned out of the can. The skin was a very dark unattractive colour and the brine certainly did not add to the appearance. When tasted raw the snoek was very firm, needed considerable mastication and the flavour was then too salt[y] to be considered good. Cooking of the snoek. It was found that when the snoek was masked with strong flavour such as cheese, tomato or curry, it made the most favourable dishes. 1. Snoek au Gratin and Snoek and Potato Pie. 4. Mustard and Cress Snoek Sandwiches. These were very popular, but it was generally agreed that the fish lacked flavour and the joy of the sandwich was in the mustard and cress. This recipe was praised because of the keeping quality and for its use in Hors d’oeuvres, but it was thought too salt and sharp with vinegar for the use as main dish.